Many factors contribute to the increasing challenges and costs of developing medicines, including more complex disease targets, increasing regulatory requirements, larger clinical trial sizes, and greater focus on targeting chronic and degenerative diseases. Companies are exploring ways to reduce development times and increase the odds of success using new research models, adaptive clinical trial designs and methodologies, eClinical tools, innovative approaches to patient recruitment, and automated techniques for analyzing data. Still, challenges remain. Despite increasing expenditure in R&D, output has declined, at least in terms of the number of compounds. 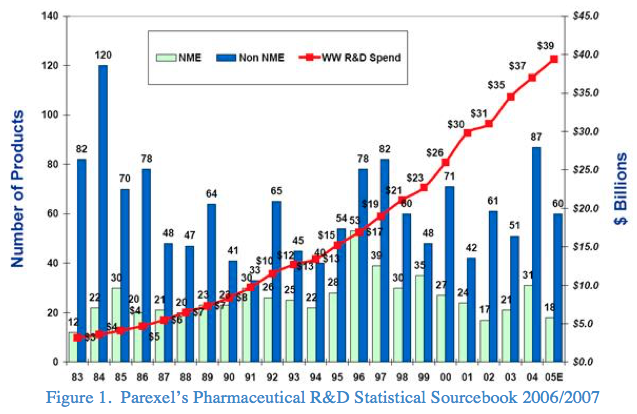 Also known as the “Innovation Gap,” the graph below (Figure 1) shows how the number of new molecular entities (NMEs) has generally declined in the last 30 years, despite a three-fold increase in R&D spending. While critics argue that not all NMEs are equally innovative (for example, one NME may offer an important new way to treat a disease, while another may work in a way that is similar to drugs already on the market), these numbers do tell a story. As we look to the future of drug development, it is worth considering the relentless influx of new technologies unfolding on many fronts. Continued adoption of eClinical cloud-based solutions such as clinical trial management (CTMS), electronic data capture (EDC), electronic trial master file (eTMF), and study startup (SSU) has resulted in a quantum leap in terms of automating manual processes and addressing inefficiencies at different stages of clinical trial conduct. But what emergent technologies have the potential to further disrupt the clinical trial process, as it exists today? There has been an explosion of new devices and applications that collect, report, and respond to information from a patient’s body, a trend that is sometimes referred to as “the quantified self.” The earliest devices took advantage of the sensors already available on most smart phones, such as accelerometers, magnetometers and gyroscopes – to track movement, count steps, and recognize sleep patterns. Because most tracking devices use phones and tablets for the user interface and rely on variants of the same sensor technology, the applications are almost unlimited. Most of the innovation occurs in the sensors used in the continuous data collection process. As such, new and custom sensors are beginning to emerge, designed for specific purposes. Dash from Bragi, for example, is a hearing aid that also features over fifteen sensors, tracking things like heart rate, respiration, oxygen saturation, and more. Alcon (Novartis) recently announced a partnership with Google to in-license their “smart-lens” technology, which may lead to a number of innovations. Plans include the development of contact lenses with sensors capable of measuring biometric data such as glucose levels. As sensors evolve, become cheaper and more readily combinable, the range and sophistication of applications is sure to expand, allowing us to combine them in ways we never thought possible. There are literally hundreds of devices and/or applications available now that can track vitals like heart rate, blood pressure, temperature, sleep patterns and even snoring during sleep. With this kind of data available from potentially millions of patients, what impact will this have on how data is collected and analyzed? Will we have remote clinical trials relying on both electronic patient reported information, as well as, sensor-derived data that is collected automatically 24x7, leveraging the power of a mobile platform without the need for costly infrastructure? Can we identify adverse events remotely and in real-time by using sensors? How will the advent of data sensors impact patient recruitment in clinical trials, including concerns about data privacy? The possibilities, while exciting, carry a mind boggling number of implications for the regulatory authorities and companies conducting clinical research, such as (but not limited to EDC, eTMF, study participation and follow up. Moving beyond sensors, wearable devices go beyond passive data collection and use the information about the individual to help them make decisions or change behavior to produce a desired result. Veristride is working on making inserts for shoes that can help stroke victims improve their walking. Linx IAS has developed a wearable sensor device that is used to measure and report on impacts to a player’s head – providing instant alerts about the possibility of concussions. Quell offers an FDA-approved device that stimulates the brain to block pain receptors for patients with chronic conditions. The device is worn around the calf in a neoprene wrap. In the future will we consider running clinical trials for pain with and without such devices? Will we recruit new patient populations into clinical trials by targeting users of certain wearable devices and their apps? As the proliferation of big data continues, from DNA sequencing to EHRs and imaging data, multi-faceted data transformation and analysis has become the next big challenge in research and clinical development. Bioinformatics continues to face challenges in integrating molecular biological data with patient information in the quest to accelerate the discovery of useful new therapies. Turning big data into “smart data” can lead to real-time solutions in disease prevention, prognosis, diagnostics, and therapeutics. Though researchers are struggling to analyze the enormous troves of 'omic' data in the quest for patient-centered health care, progress is beginning to emerge. These efforts do not come without significant hurdles and challenges. A recent Nature article warns that the computing resources needed to handle genome data will soon exceed those of Twitter and YouTube.1 This team of biologists and computer scientists are worried that their discipline is not geared up to cope with the pending tsunami of genomics data.2 Indeed, the realization of the landmark $1,000 genome (which brought great opportunity for Big Data and clinical research) also created profound challenges for storage, transfer and security of information. In fact, it may now be less expensive to generate the data than it is to store it. Some see the ‘big data’ or ‘analytics’ future involving analysis of bioinformatics and patient data as only part of the picture. Is there an untapped source of data in social media that is not being leveraged? The crowd is currently unwittingly providing us with valuable data (which we are not capturing and saving) that can be readily extracted from the web and social networks. How can we leverage this vast trove of information to improve clinical research? Using technology that has enabled the collection of over a billion social media conversations from thousands of different websites, for example, a company named Treato is collecting real-time conversations that involve patient experiences using medications for various conditions. These conversations are interpreted and organized on Treato’s website for easy access by patients looking for relevant information on the medication they are using to treat their condition. Treato is also a valuable resource for pharmaceutical companies looking gain insights into patient experience on various medications and/or discover health trends that would normally take many years of research to discern. Some may argue that we are moving into the era of drug safety analysis, drug repurposing and marketing by sentiment analysis using social media stream mining tools such as Teranode and Ceiba (recently acquired by Perkin Elmer). Some social media companies are focusing on health and treatment-related discussions that allow users to give feedback on the effectiveness of a given treatment. CureTogether, for example, has collected data on treatment effectiveness for over 600 disease conditions. Clinical trials could potentially leverage these condition-focused patients in ways that improve the efficiency of the drug discovery process. One potential problem created by the proliferation of treatment effectiveness data being readily available online is patients involved in clinical trial using this information to ascertain whether they are receiving the placebo of the medication. This could certainly provide an interesting challenge for CROs managing clinical trials. Finally, swarm intelligence is an emerging field of biological artificial intelligence that offers solutions to complex problems and has already been used for disease surveillance and predicting health interventions. Where this can lead us, has yet to been seen. If at some point all of these technologies converge and rationalize, we may have nothing short of a revolution in clinical research on the horizon – as we shift from relying on patient reported outcomes to sensors and wearable devices that live and breathe with the patient. In this new order, each patient becomes a big-data producer. Imagine a world where patient genotype and medical histories are mashed up with social media data sources and sensor-derived patient surveillance information. What happens when the data collected by the sensor(s) conflict with the experience reported by the patient? This is not something we have had to consider before and probably represents the first of many new issues we’ll need to face from the resulting paradigm shift. Eisenstein, Michael. Nature. “Big data: The power of petabytes.” 527, S2–S4 (05 November 2015) doi:10.1038/527S2a. Available at http://www.nature.com/nature/journal/v527/n7576_supp/full/527S2a.html. Check Hayden, Erika. Nature. “Genome researchers raise alarm over big data.” (07 July 2015) Available at: http://www.nature.com/news/genome-researchers-raise-alarm-over-big-data-1.17912.